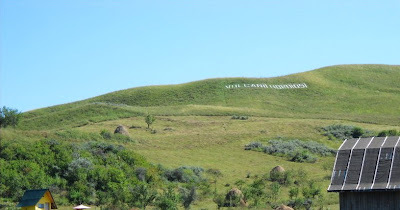 In Romania, nearby Buzau, at Berca commune, the Muddy Volcanoes / Vulcanii Noroiosi are waiting to be seen. 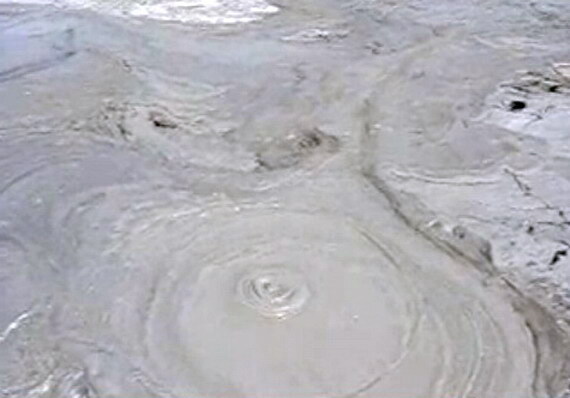 Located on the hills in the geological and botanical reservation Berca Mud Volcanoes, the mud volcanoes were created by the salty mud and natural gases eruptions at 3km deep towards the surface. The mud has white - gray color, it is cold, with some sulfur smell and very salty and is bubbling beneath the crest of the hills from small volcanoes craters. Once the mud overflow through the volcanoes mouths (with low speed and in a continuous way), it dries and creates conical-shaped structures. 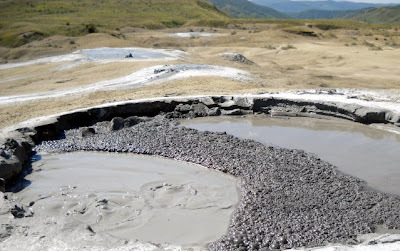 Some of these craters have more than 6m high and can be seen on two hills near the Berca commune: The Little Mud Volcanoes and The Big Mud Volcanoes known as Paclele Mari and Paclele Mici. This phenomena was remarked in many regions: on the land in Italy, Ukraine, Siberia, Australia or underneath the North Sea and Caspian Sea. 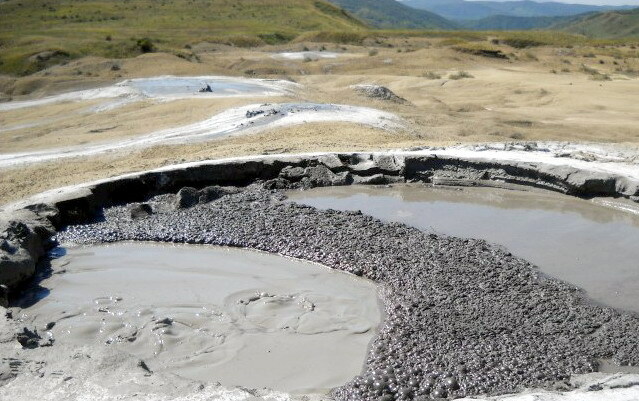 In Romania, also, in many places from Moldova and Transylvania with salty soil were observed small muddy volcanoes, but the Berca Mud Volcanoes Reservation as a whole is a unique place in Europe. The Romanian muddy volcanoes are not hot as mud volcano from Yellowstone National Park and not so scary as the Indonesian muddy volcanoes, the Sidoarjo mud flow, which sent out in 2006 more than 30,000 m³ of mud per day and it is expected to continue for the next 30 years in same manner. When traveling through Berca Mud Volcanoes Natural Reservation, unusual and strange feelings are a regular occurrence (I tried to capture how strange looks in my pictures). In these mysterious and pretty amazing places where everything feels alien, the plants are missing and the whisper of wind and blurbs of the volcanoes are the only sounds you can hear.
" There the Devil has mounted his boilers with boiling tar; below ground the muddy clods are gurgling and boiling, colder than ice, darker than fog; then, through opened mouths all over the non-drained valley, the mud is bubbling upwards, bursting out either at a palm or a fathom height; around each hole's mouth has lasted mud mound, and the drooling tar spited by Devil out of caverns, are flowing along the greasy mounds, gathers in the mud, dries in the wind, breaks in the sun-rays and spread out throughout the valley a gray and wet clay in which does not grow any knot-weed or thirstle. Acolo si-a aşezat Necuratul cazanele cu catran si cu smoala clocotita; pe sub pamant galgaie si fierbe glodul noroios, mai rece decat gheata, mai negru decat ceata; apoi, pe guri cascate prin tot ocolul acelei vai fara de scursoare, tasneste tina in sus, cand de o schioapa, cand de o palma, cand de un stanjen si mai mult; la fiecare gura imprejur s-a durat musuroi, si balele catranite, pe care Uciga-l-toaca le scuipa din vagauni, se scurg naclaite d-a lungul movilitelor, se aduna in namol, se usuca de vant, se crapa de soare si astern tot fundul vaii cu o huma sura si jilava, pe care nu se prinde, Doamne fereste! nici troscot, nici ciulini." 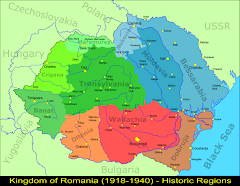 Getting there from Bucharest (around 3 hours drive), take the E85 road to Buzau, then take the road DN10 to Nehoiu. 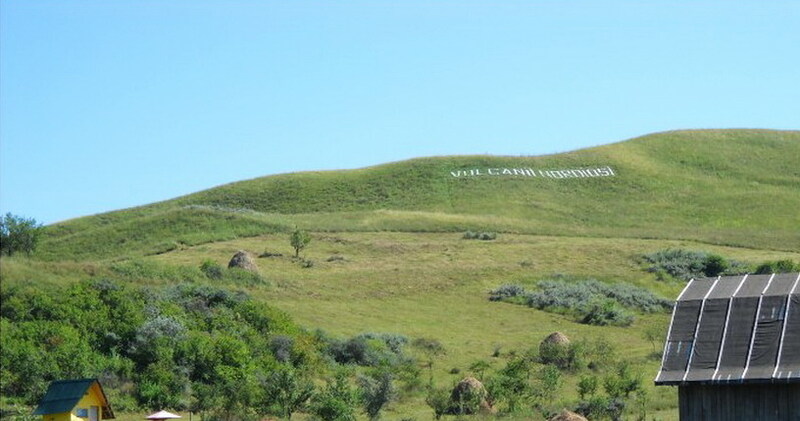 This road was renovated and is well marked with panels pointing towards Vulcanii Noroiosi (The Muddy Volcanoes). At 15-20 kilometers down, turn right in Satuc village to Berca, crossing the Buzau river, then follow the road until you will see a billboard on the hill pointing to them. There you will discover the spectacular selenar landscape with large crevasses and mud hollows that lies on several hectares of gray, dry and salty hills. Indeed, there are not very well developed tourist facilities, but it is a good choice to go there, to have a glimpse of their beauty and wilderness and to take some pictures in one of the best known geological reserves of Romania.